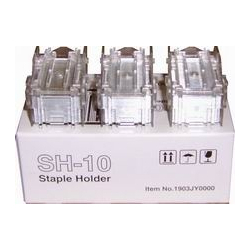 Genuine OEM Copystar 1903JY0000, DF780B, SH10 Staples. (1 pk) They are designed to work in the Copystar CS-205C, CS-250CI, CS-255, CS-255C, CS-300CI, CS-305, CS-3050, CS-400CI, CS-4050, CS-500CI, CS-5050, CS-C2520, CS-C3225, DF-780B, EP-5100DN, EP-C320DN, FS-9130DN, FS-9530DN, FS-C8100DN, KM-4050, KM-5050, KM-C2525E printer/copier(s). Genuine OEM Copystar Staple Cartridge. They are designed to work in the Copystar CS-3035, CS-4530, CS-6030, CS-8030, CS-C2520, CS-C3225, DF-650, FS-9120DN, FS-9250DN, KM-C2520, KM-C3225 printer/copier(s).